Good day, horror fans. Hopefully everyone is still enjoying Halloween displays in stores that haven’t already been completely taken over by the brightly-lit mess that is Christmas. October is a great month for horror releases, and you can find the multi-genre Dracula Untold in theaters now - though you’ll probably have a better time with Tommy Wirkola’s Nazi zombie sequel Dead Snow 2: Red vs. Dead, or possibly Christian E. Christiansen’s cult thriller The Devil’s Hand. The latter two are now out on VOD, and more recent releases await you in the following stories. Director Dario Argento has created some of the most singular works of horror art in Deep Red and Susperia, among others, but the filmmaker’s output hasn’t been particularly impressive for a while now. 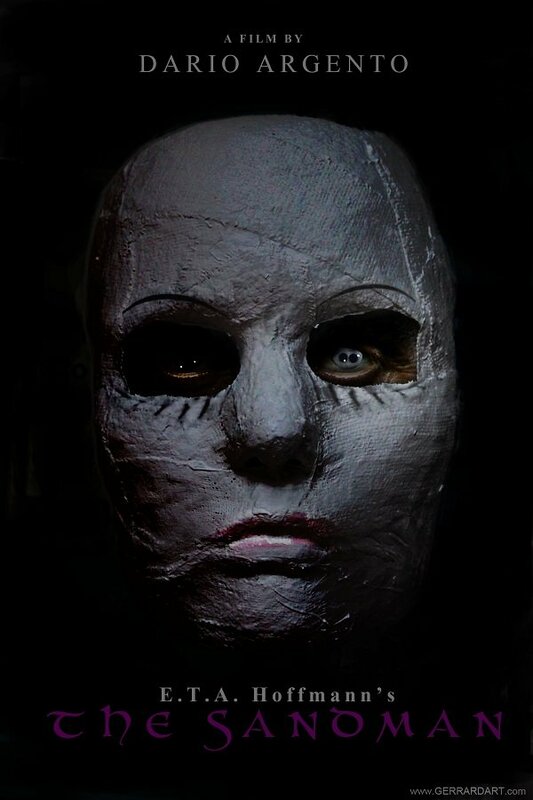 For his next project, The Sandman, Argento has started up an Indiegogo campaign to assist in getting it funded, and you can watch the promotional video for it above. You may notice that music legend Iggy Pop is in it, and that’s because he would be playing the titular monster, whose M.O. is about as wicked as they come. Personally, I think an Argento/Pop collaboration would have been more interesting in the 1970s, but I’m definitely interested to see it play out here. Check out the poster below. The script for The Sandman was written specifically for Argento by David Tully (Djinn) and Goblin’s Claudio Simonetti (Susperia). The film centers on Nathan, a student whose past includes stumbling upon a serial killer dubbed The Sandman killing his mother as he would his other victims: by taking their eyes out with a jagged melon spoon. (It’s partially inspired by the original legend of the Sandman.) Nathan killed him back then, or so he thought, and he’s expectedly shocked once people start dying in the same way. He is forced to confront his past and other things in order to stop the killer again. With Argento behind the camera, this could be an excellent slice of extreme cinema, but only if people pour money into it. In three days, The Sandman has raised over $18,000 of its $250,000 goal, which is a positive start. Tell your friends that Iggy Pop wants to scoop out people’s eyeballs, and that they have to pay $5 for it. 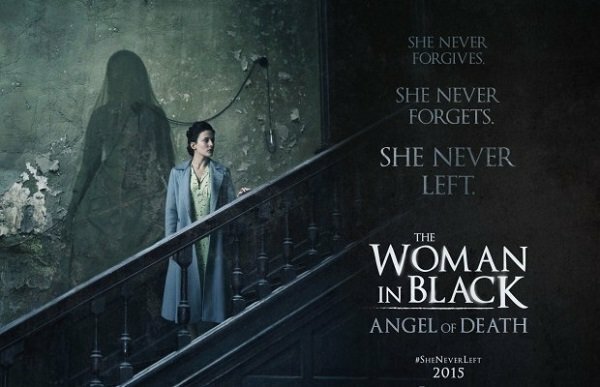 Despite being a completely unnecessary sequel, Hammer Films’ The Woman in Black: Angel of Death is coming to us from Relativity Media on January 30, 2015. Above is the newest teaser, which quickly develops a spooky atmosphere with Dame Vera Lynn’s "We’ll Meet Again" playing (and skipping) on a record player. A kid walking through an old house isn’t revolutionary or anything, but it’s not terrible. Unfortunately, that’s when the bottom drops out for a terrible "GOTCHA!" jump scare, in which a face just appears out of nowhere and then becomes the background to the film title. If this is how things are being teased, that doesn’t bode well for the final product. Here’s a new poster. The Woman in Black: Angel of Death takes place 40 years after James Watkins’ 2012 film. London is being demolished during World War II, and a schoolteacher named Eve (Phoebe Fox) takes a group of schoolchildren away to safety - or so she thinks. Naturally, they end up at Eel Marsh House, where the children once again awaken the evil Woman in Black (Leanne Best), who presumably makes everyone’s lives a whole lot scarier. I liked the first film, despite its flaws, and I’m interested to see director Tom Harper’s approach to supernatural horror. But I’m going into this one with reservations, its January 30 release date notwithstanding. Everybody remembers the home invasion thriller The Strangers, right? It’s been six years since that movie came out, and its director Bryan Bertino is finally getting his sophomore effort Mockingbird to audiences, via the Blumhouse Productions offshoot BH-Tilt. It was sitting on the shelf for a while without a distributor, but you can now find it on VOD, and the above trailer should be a good litmus test on whether you’d want to do that or not. It’s got a clown in it, and some digital voice manipulation to make things sound spookier. But this ain’t Jigsaw or Ghost Face. The plot involves three people getting video cameras as "presents" at their doorstep, and instructions that the must start filming themselves, for if they stop, someone will die. That certainly clears up the "how do they justify the first-person perspective" question. There’s something distinctly unnerving about seeing the inside of one’s own house through someone else’s lens, so I can appreciate Bertino’s graduation to "mental home invasion," though I’m sure the film will skew conventional in many ways, as these kinds of films often do. Part of me thinks this will feel as cheap as it looks, but I’ll hold out on reservations until I check it out. Maybe I’ll get the DVD in the mail one day, wrapped up inside a big red box. 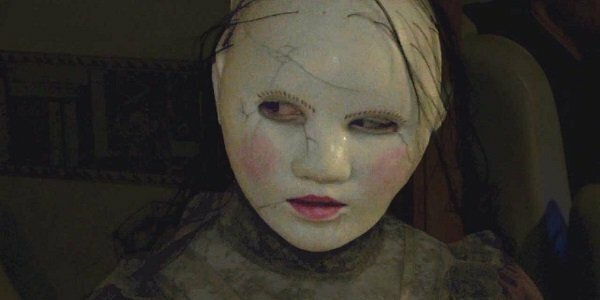 Also released on VOD this week is Bobby Roe’s haunted house thriller The Houses October Built, a found-footage tale where five friends drive around in search of the scariest haunts they can find. They’re not interested in just strobe lights and prosthetic masks; they want to find "the real thing," and though the film as a whole isn’t as pleasing as some of the sequences therein, it’s a solid Halloween-loving romp (and that little girl-thing seeped into my brain immediately.) 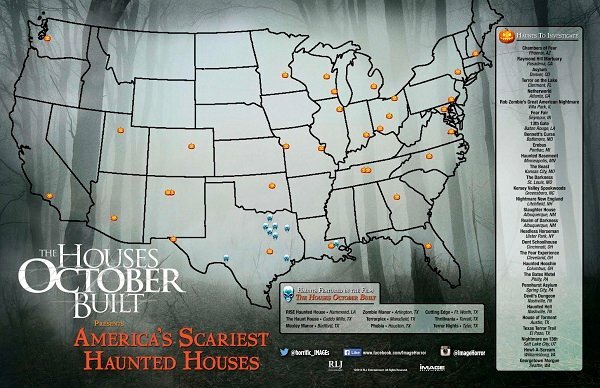 To celebrate the season in non-movie form, the folks behind The Houses October Built put together a map of "America’s Scariest Haunts" for your fear-filled trip-planning needs. Check it out below, and click on it for a bigger version. There are 39 haunts listed here, with nine of them serving as the settings for the attractions seen in the movie itself, which takes place in Texas and Louisiana. Some of the ones in the film looked pretty awesome, so I’ll be keen on checking them out in years to come. I’ve been to one of them, along with a couple of others listed on the map, but now I want to take the next three weeks or so and spend them doing almost exactly what the movie’s characters did. Just without filming it, because I sound stupid when I’m recorded. What’s the scariest haunted house you guys have been to? While I don’t have a single iota of data to back me up, I’m going to blindly assume that there is a large crossover between horror fans and amusement park lovers. For those of us that fit into that demographic, Fox’s upcoming comedy horror Thrill Ride sounds like a heavenly matchmaker. The film centers on students at a high school with a fairly large bully-to-victim ratio. For Senior Night, an amusement park is rented out for the student body to go on rides and play games without any bothersome lines or other people. But there’s a vengeful killer among them who starts taking out the bullies via the different park rides, and kids from different social groups must team up to identify the killer. I’ll take this kind of gratuitous violence any day, though the team behind it is more known for their comedy skills than their bone-chilling talents. The idea for Thrill Ride was conceived by Andrew Jay Cohen and Brendan O’Brien, the guys who wrote Nicholas Stoller’s successful comedy Neighbors, and Cohen will make this his feature directorial debut. They duo won’t serve as screenwriters though, as that task falls to Peter Warren, who wrote an episode of MTV’s Happyland, a series that also takes place in a theme park. All I need to see is someone’s decapitated head being rolled up a skee ball lane and I’ll be sated.